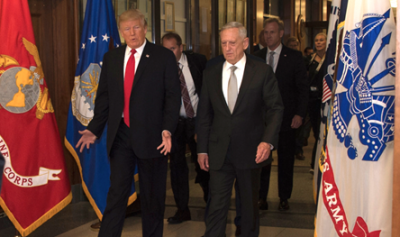 In what must be a relatively uncommon if not unprecedented move, President Trump’s Chairman of the Joint Chiefs of Staff — the country’s senior-most military officer — Gen. Joseph Dunford told the Senate Armed Services Committee last week that Iran is complying with the agreement and that the United States would suffer negative consequences if it pulled out of the deal. …not in compliance with the agreement and they certainly are not in the spirit of the agreement in compliance, and I think you’ll see some very strong things taking place if they don’t get themselves in compliance. Dunford made the point to the Senate Committee that if the US unilaterally pulls out of the Iran deal claiming non-compliance while the rest of the world holds the opposite view it would negatively impact the US ability to make future deals. No doubt he was thinking of the current stand-off with North Korea. It makes sense to me that our holding up agreements that we have signed, unless there’s a material breach, would have an impact on others’ willingness to sign agreements. Gen. Dunford’s concern over whether the US would continue to be a trusted and reliable partner after unilaterally de-certifying Iran is particularly relevant when one looks at the fate of former US allies such as Libya’s Gaddafi, Saddam Hussein, Panama’s Noriega, and so on. Unless the US is able to strong-arm a considerable number of its allies into also decertifying Iran, the US would find itself backed into a corner on any non-unilateral, non-military efforts overseas. The US would be likely hard-pressed to find a sufficient number of allies willing to follow Washington back to a policy of open confrontation with Iran, particularly as the economic opening to Tehran has proven so profitable and mutually advantageous to them. The military officers so often deferred to by President Trump are on one side of the Iran recertification issue and the president and his fair weather cheerleaders in the neocon camp are on the other side. Trump’s trigger-happy ambassador to the UN, Nikki Haley, in a September speech to the neoconservative American Enterprise Institute said that President Trump would have “ground to stand on” should he decide to decertify Iranian compliance. Her argument was the opposite of Gen. Dunford’s, as she claimed that the US remaining in the deal with Iran would demonstrate to North Korea that Washington is more interested in placating its allies than in looking out for its security interests. Sen. Cotton’s already aggressive position vis-a-vis Iran was no doubt further greased by the nearly one million dollars he was paid by neocon kingpin William Kristol‘s Emergency Committee for Israel to oppose the Iran deal. At least he is clear about his alternative approach to Iran. Former US Ambassador to the UN John Bolton, who is no doubt already measuring the drapes in Secretary of State Rex Tillerson’s office, went so far as to pen a helpful guide to exiting the Iran deal for President Trump. Despite Bolton’s verbosity — a neocon specialty — his grand plan for exiting the deal consists of: 1) strong-arming allies, 2) producing more neocon “white papers” on how bad the deal is, and 3) further propagandizing Congress and the American people. Where exactly is Iran in violation? Bolton doesn’t say. And what is Bolton’s next step once his decertification “plan” is implemented? In his own words: “Expedite delivery of bunker-buster bombs” to the region. Will President Trump listen to Bolton’s roadmap to exiting the Iran deal? Will he consider Bolton’s track record when it comes to planning foreign policy actions? If Bolton were a baseball player, he’d be benched with a .000 batting average. Will Trump listen to Nikki Haley, Bill Kristol, Tom Cotton, or the rest of the neocon desk generals when it comes to Iran? Or will he listen to his actual generals? This may be the most important foreign policy decision in Trump’s presidency. Grave matters of war or peace hang in the balance. Will the neocons win again?